Wed Apr 1st 5 miles Over to Hatch End in the evening; cold and damp. Thurs Apr 2nd 16 miles Cool, blustery and showery in the morning. Went up to Gordon’s later and then knocked about. Got the bike ready for the morning. Fri Apr 3rd Easter Tour to Cheddar Gorge. I called for Alan and then left Northwood at 9.15 a.m.; eight riders all together, including two tandems. We went down through Slough and the Bath road to Maidenhead to Twyford for elevenses. The tandem punctured. We then struggled on to Mac’s café into a head wind for dinner. After dinner we continued down the Bath road through Thatcham, Newbury, Hungerford to Marlborough where we booked ‘digs’ for our return on Sunday night. We turned off the Bath road at Beckhampton to Devizes (egg and chips tea), Trowbridge and on to Frome in the dark. We stayed overnight in Frome at a good place and had a few beers in the town. Sat Apr 4th 45 miles We left the ‘digs’ at about 9.30 a.m. up a big hill and then down to Shepton Mallet and Wells. We looked around the cathedral at Wells and Stan Boyes took several photographs. We had our elevenses in the place we are staying the night and then pushed off to Wookey Hole. Went into the caves (2/-) and then struck off into the Mendip hills up a long and steep hill to Priddy where we had to shelter from a short but violent shower. We then continued along the top of the Mendips finally descending the Gorge at Cheddar. Visited Gough’s caves – I have not been there before – saw some wonderful examples of stalagmites and stalagtites. I bought a 1½ pint Cheddar mug in a shop here [I still keep my pencils in this] before pushing off along the lower road back to Wells for the night. Had a drink in the evening and met Harry Ford who had come down by train (with his bike). A very nice day. Sun Apr 5th 78 miles [We had some strange looks from our hosts when we got in last night! As usual, we had had a few pints and were probably a bit worse for wear. It was only as we left in the morning did we see a sign swinging over the door: Temperance Hotel]. We re-visited Cheddar this morning for Harry’s sake and got caught in a very heavy fall of hail and rain at Westbury. After having some elevenses in Cheddar we climbed the Gorge and then turned left to Chewton Mendip and eventually to Bath after a long and easy free-wheeling stretch. Dinner in Bath and then we pushed on up Box Hill to Box, Pickwick to Chippenham and Calne to tea at the bottom of the White Horse hills. Alan and Roy then disappeared with Stan, and I rode the 10 miles to Marlborough with the two tandems and Harry Ford somewhere in the rear. Had super ‘digs’ in Marlborough and also found another good pub in the evening. Today was the wettest day yet but many sunny spells. Mon Apr 6th 85 miles The last day of the tour; wet at first but sunny later with showers. 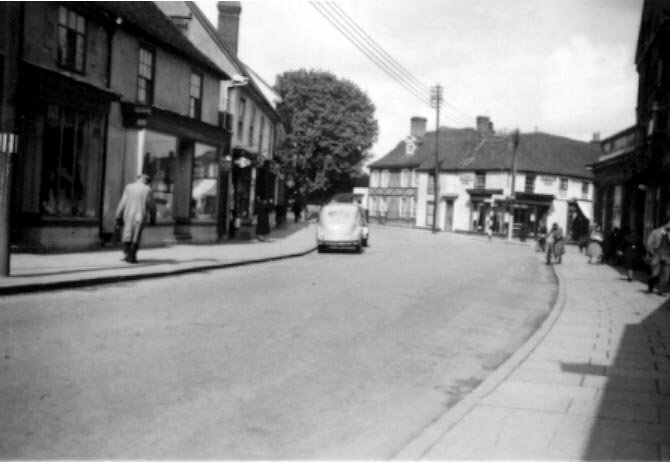 We left Marlborough at about 9.45 a.m., climbed the hill and struck off at a good speed through Hungerford, Newbury and Thatcham to elevenses at a café near Mac’s. We then rode down the Bath road for a while, had a beer, and met the racing boys at Jack’s Booth. They had ridden in the Actonia ‘25’ in the morning. Jimmy Jack had done 1.06.05, Brian Major 1.06.28 and Tony Standing 1.9.00. Had dinner in Reading before heading home up the Bath road and Slough. A very nice day and a good tour (312 miles; spent £3.10/-). Tues Apr 7th 33 miles In the morning and afternoon I stripped down the Thanet and removed all the paint with the help of some stripper which I bought in Eastcote. I shall paint it tomorrow. [In hindsight this was one of the worst decisions I made. I regretted it for years!]. In the evening I went out training through Rickmansworth and Chalfont to Amersham and then home via the Chalfonts and the viaduct. A warm night with very little wind. I received the start sheet today for the Norlond ‘25’ on Sunday. Wed Apr 8th 28 miles Up to Gordon’s in the morning to buy green lacquer for the Thanet, new brake blocks, handlebar tape and cotter pins. I painted the frame when I got in; it is coming on quite nicely. Len Chapman came round later with my B 57 saddle which he had picked up at Gordon’s. In the afternoon we went out for a ride through Rickmansworth, along the Denham by-pass and home via the Bell Works hill and Harefield. A warm afternoon. Held a committee meeting at Alan Stratman’s in the evening. Thurs Apr 9th 30 miles Over to Sheila Johns’s house in the morning at 8.30 a.m. to collect a letter from Mr Thorne at Crookes about ‘our’ trophy. I then took it over to Boff’s works at Chepstow Place W.2., down the Harrow Road through Wembley, Willesden and Paddington to Bayswater. Had some refreshment there and then returned via Notting Hill, Kensal Green and the Harrow Road. I then went up to Gordon’s with my frame and collected my back wheel. Met Len. Went to Eastcote in the afternoon. Roger came round. Cleaned some of the paint off my Thanet. Stayed in for the evening. Fri Apr 10th 27 miles Went out for a ride with Roger Bingham through Rickmansworth, Chorleywood, The Swillett, Heronsgate, down the Denham by-pass and home through Denham and Harvil road to Ickenham and Ruislip. Warm and sunny and a very nice ride. In the afternoon I went up to Pinner for a haircut. Met Roger again and we came home to my house. We did not go out again in the evening. My parents are away this Sunday so I shall be out all day. Sat Apr 11th 8 miles Went up to Gordon’s bike shop in the morning and had coffee out. Bought some new mudguards for the Thanet, but the frame was not yet ready. I shall collect it on Monday. Rather windy today – I hope that it lessens by tomorrow for the Norlond ‘25’. In the afternoon I watched the racing at Herne Hill on the television. Cyril Peacock won all his races brilliantly and Dave Bedwell also won with a terrific sprint in the professional handicap. The programme lasted for an hour and a quarter and several of the riders were interviewed. Stayed in for the evening because I am getting up in the morning at 5.00 o’clock. Sun Apr 12th 63 miles Up at 5.00 a.m. and called for Roger at 6.15. We rode out to the start of the Norlond combine ‘25’ course (F4) at Bignall’s Corner. Got bike ready and was off number 71 at 7.41. Flew out to Ryder’s corner with the strong wind and then turned left along the North Orbital into a powerful head wind to the first turn. I was caught along here. Back along this stretch was not much easier, but there was an easier stretch along through Hatfield to the far turn at Welwyn. Coming back the wind was so powerful I could not have been doing more than about 18 m.p.h. and was standing up in places! I finished in the disgusting time of 1.12.12. The event was won by R. Ingle of the Elsynge R.C. with a 1.04.18; I came 66th out of 117 starters. Alan Stratman came 13th with 1.06.57, a really magnificent effort. Jim did a 1.8 and Colin a 1.10. Roger did a 1.15 (!) on the F4A course which was the faster and easier course this morning. After the event it started to pour with rain so we came home via the North Orbital and Watford. Got very wet and the bike soaked. Spent the afternoon at Roger’s and then went to the pictures. A waste of a day! Mon Apr 13th 22 miles Went up to Hatch End and then over to Gordon’s in the morning but the frame will not be ready until dinnertime. Spent the morning cleaning the Holdsworth which got really mucky yesterday. I hope that this wind drops before Sunday’s ‘30’ because I am fed up with doing times six minutes slower than my best! It may be all right for chaps like Alan who go out to win an event, but a chap like me, who has little or no chance of winning, rides to improve his time. Good weather conditions are therefore essential. Went up to Gordon’s again in the early afternoon and this time brought my Thanet frame back. Fixed it up when I got in; it looks very nice. I then went over to Roger’s with his stuff but the house was empty so I left it round the back. Club night. Paid 2/6 for the club ‘30’ this coming Sunday and saw Harry Ford’s Easter tour photos. I shall probably have several. 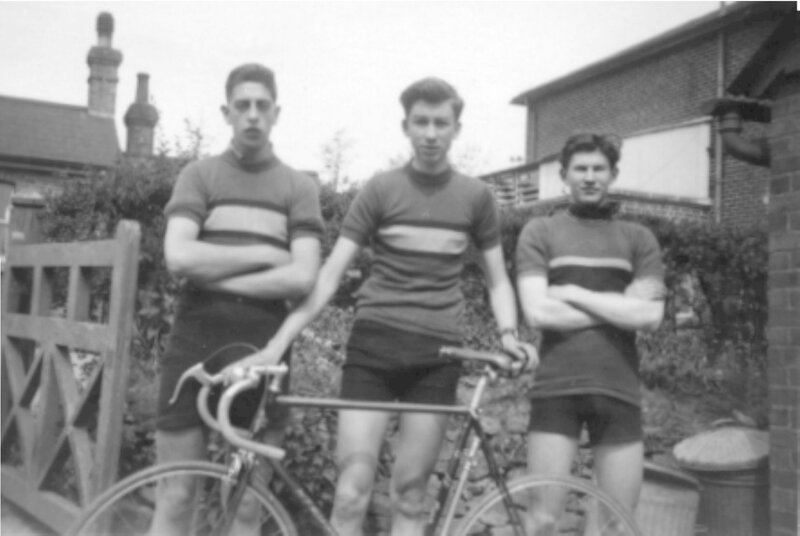 It seems that about seven club members want to ride in the WLCA ‘25’ on May 17th so we (Roger, Brian Huggins and I) will probably ride in the Advance Wheelers 1.6.00 event on the same morning. If, however, we beat 1.6 before then we will ride the WLCA event. If I ride the Advance Wheelers event I cannot ride at Slough track. [What a complicated life! In the end we rode the WLCA event]. Tues Apr 14th 54 miles Did several things to my bike and some (school) work in the morning. In the afternoon I cycled over to Ickenham to meet Tony Standing and, after collecting his cycling shoes, we went for a ride (24 miles) through Ickenham, up Breakspeare road to Harefield, down the hill and along the Denham by-pass to the bridge, then right up past the airport and into the wind to Rickmansworth. We came home via Batchworth Heath and Northwood. A nice afternoon but very windy, cool and showery. We had a snack at Mill End. In the evening I went training with the boys to Beaconsfield. Very fast coming back. Wed Apr 15th 10 miles Went out for a short ride in the afternoon through Pinner to Northwood where I dropped the Easter tour report at Bob’s house [for the club magazine]. I then went down to the bottom of Joel Street and out through Ruislip Manor, Ruislip to Knight’s [cycle shop] at South Harrow. Home via Rayner’s Lane. Windy and tiring, although the wind dropped later. Thurs Apr 16th 41 miles Out for a ride with Tony Standing in the afternoon, down the viaduct, along the Slough road, and then off into the lanes through Fulmer, Farnham Common and Hedgerley to Beaconsfield. We came home through Jordans, Chalfont St Peter (where we had some tea) and Harefield. Did not go out training in the evening because of the rain. 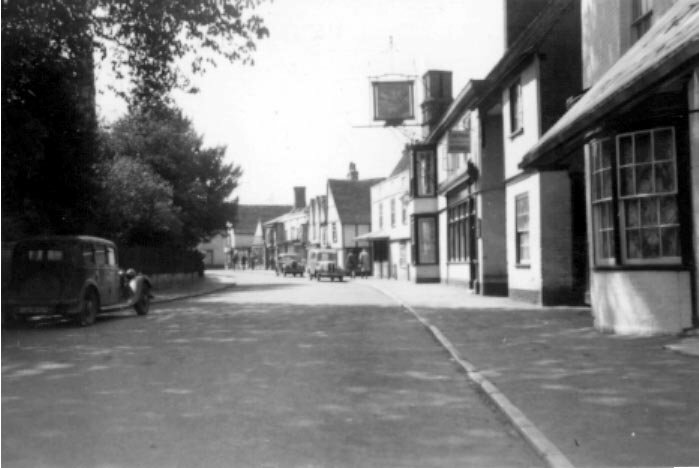 Fri Apr 17th 39 miles Went to Pinner in the morning and wrote to Brian Huggins [c/o the RAF]. I then went to Eastcote and had a little ‘ride around’. In the afternoon I called for Tony but he was cleaning his bike and, as it was starting to drizzle, we decided not to go for a ride. I came home via Ruislip and Cheney street. Out training (hard as well!) in the evening through Rickmansworth to Amersham; home via the Chalfonts and Ickenham. A nice warm night with little wind. I hope that these conditions last until Sunday. Sat Apr 18th 10 miles Did usual things in the morning and afternoon. Got bike ready for tomorrow’s club ‘30’. I am off number 15; there are 22 riders. Sun Apr 19th 98 miles Up at 7.00 a.m. and out of the house by 7.40. I was off at 8.54 and improved to do 1.21.39 (22.045 mph). It was very blustery and the only stretches which could be called ‘easy’ were from the turn back through the Missendens, and from Amersham home. Colin Turner won with 1.19.44 beating Alan Stratman into second place (1.20.06). Jim Farrell and Brian Major both did 1.20.22 and I came fourth. Brian Major also took 1st handicap, screwing me into second place by only two seconds. A nice sunny morning; came home for dinner. We went out in the afternoon through Rickmansworth to Missenden and then to tea at the Limes café at Princes Risborough. Had a super tea and I took a photo of the club outside. Came home via High Wycombe, Beaconsfield and the A 40. A very nice day which although windy was cloudless and very warm for a change. Rode in shirtsleeves this afternoon. Mon Apr 20th 12 miles Rode up to Pinner early and took my cycling shoes in to be mended, and also bought a watch strap. Back to school today; then club night in the evening. Played darts and took dinner bookings for Sunday’s run. Sheila [Johns] gave me several negatives of our Easter tour and Stan [Boyes] brought up several of his photographs. He has a good one of me racing and he says that he will have it enlarged and printed for me. Gave Brian Major information on some ‘digs’ in Aylesbury. Wed Apr 22nd 40 miles Received the start sheet for Sunday’s event [Eclipse R.C. ‘25’]; I am off number 112. Went for a ride in the evening out through Rickmansworth and Chorleywood, through Amersham to the ‘25’ turn just beyond Missenden. Came back down the course apart from a detour to Little Missenden, then home via Ickemham. A very warm day, sunny and cloudless. Fri Apr 24th 19 miles Went for a short ride with Len [Chapman] through Harrow and Wembley. We climbed Harrow hill several times. Saw Tom Simpson and Ken Dopson. I am going to Flatford Mill next Wednesday [a school trip]. Sat Apr 25th 71 miles Went up to Pinner in the morning and then up to Gordon’s. I bought a new pair of pedals for the Thanet. Made final arrangements for the weekend and got the Holdsworth ready. I took a photo of it all packed up. In the afternoon, about 2.45 p.m., Len, Roger and I left through Slough and Windsor Great Park to Bagshot (refreshments). After this we pushed on through Farnham, Bordon and Liss to stay with Len Chapman’s aunt. We had some super food [apparently two dinners] and then slept on the floor. I got a fly in my eye at Farnham and suffered muchly. Sun Apr 26th 105 miles Up at 5.30 a.m. and out with the boys and Brian (Len’s cousin) at 7.00. We retraced our way to Farnham and on to the start. It was easy out to the turn through Alton and East Tisted, but a rising wind on the way back slowed me to a 1.07.23. I did not catch anyone and no-one caught me! Roger did 1.07.07 and Len 1.08.12, so the Northwood Wheelers team did a 3.22.42 and came 6th out of 33 teams! We went back to Liss with the Southdown R.C. boys (Brian did a 1.11) and then got our bikes ready for the return journey. We had our breakfast at 12.00 noon. We then pushed on up the hill to Rake and finally to Hindhead (12 miles) where we met the club for dinner. Took three photos. Came home via Godalming, Guildford and Woking to Staines for tea. Then back through Iver and up the viaduct. A very hard ride home with a very heavy bike. Suffered with back-side! E. Tinker of the Willesden C.C. won the event this morning with a 1.04.31 and we had photos taken and a free cup of tea at the finish. Ken Dopson did a 1.08.56 in the Clarence Wheelers ‘25’ this morning. It was very warm today at times and altogether an excellent weekend, although tiring. Mon Apr 27th 10 miles Club night. Paid Alan Stratman (who is doing Colin Turner’s job as Open Events Secretary for a while) 3/3d to ride in the WLCA ‘25’ on May 17th. We are not riding in the Advance Wheelers event because Roger cannot afford it and we cannot find another third man [for the Junior team]. I hope that I can get in the WLCA event because there are already four faster riders from the club entered. I will now be able to ride at Slough track in the afternoon. Up at 6.00 a .m. and on the road by 7.00, out through Hatch End, Watford, Aldenham and Radlett to Welham Green, Hatfield, Essendon and Hertford. I then pushed on through Ware and Much Hadham to Bishop’s Stortford where I had some elevenses. After this refreshment I continued on to Dunmow, stopping in the town to take some photos. I then rode with a strong tail wind blowing me on through Braintree and Coggeshall to Four Marks where I had my sandwich lunch. On then to Colchester where I visited the castle and the Essex museum; then on to Manningtree and the river Stour. I looked around Manningtree for a while, then crossed the river over to the village of East Bergholt. I spent the afternoon looking round the village with its church, priory and ‘bell cage’ and then to Flatford Mill. A very nice day, cool and blustery, but the wind was behind me.